Wait will soon be over for fans, Call of Duty: Infinite Warfare Multiplayer Beta is coming soon. 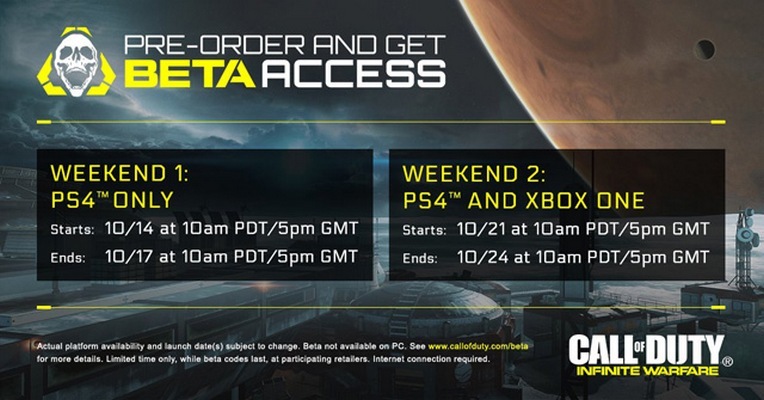 Those who have pre-ordered the game on PlayStation 4 will be able to join the beta first, starting at 10am PT on Friday, October 14. Call of Duty: Infinite Warfare multiplayer allows you to customize your play like never before, with the fast-paced gameplay that Call of Duty is known for, giving you more ways to optimize weapons and gear to your personal style of play. Infinite Warfare introduces the most advanced tools of war: combat rigs, high-tech equipment, and unique prototype weapons. Everything – including weapons, equipment, lethals and tacticals – has been built for a variety of play styles, where you have the power to combine them however you want. Movement in Infinite Warfare multiplayer builds from the fluid, momentum-based system of Call of Duty: Black Ops III and is evolved to custom-fit the new combat that will still feel familiar to any Call of Duty player. The beta’s content will be announced in the coming weeks.